In your Chrome browser, go to Slack and click the add button next to the message input window and click ‘Send Anywhere’. 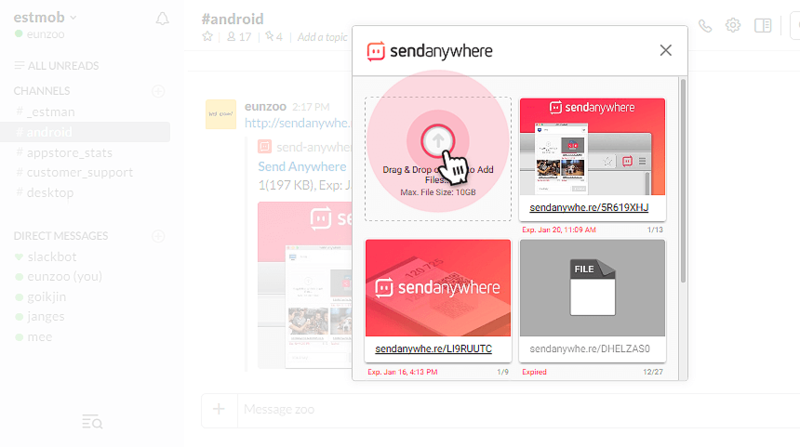 Click the file upload area of Send Anywhere to select the file to attach, or drag and drop the file to attach. You can also attach an already uploaded file. If you select a file to attach, an address is created to download the file to the message input window. Once uploaded, files can be downloaded for a week without any limit. You can also attach files by right-clicking on the message input window and clicking the ‘Activate Attach files with Send Anywhere’ menu.